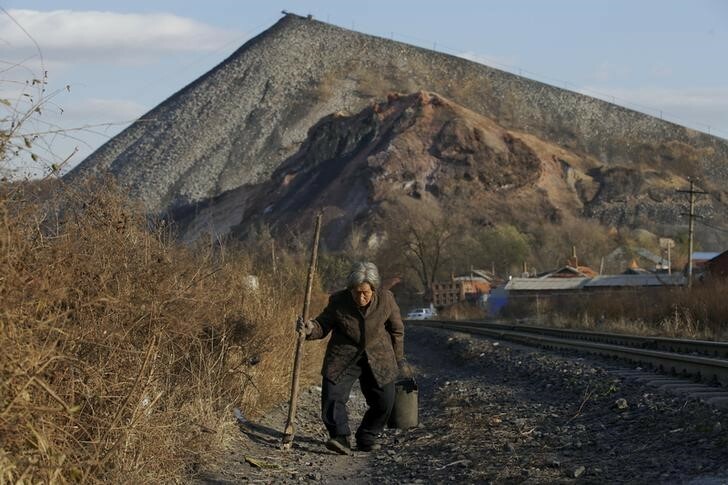 Jixi, China (Reuters) — The northeast mining city of Jixi bears the scars of China’s slowing economy and ailing heavy industry. Giant mounds of unsold coal sprout weeds in the makeshift depots marking nearly every junction, and bitter Siberian winds blow sulphurous dust through streets peopled by laid-off miners. “This is a coal city and there is nothing else,” said Xin Qinling, a former miner now responsible for dwindling shift rotas at Jixi’s depleted Zhengyang coalmine. State-owned Longmay Group, which owns most of the collieries in Jixi, including Zhengyang, has been making losses since 2012. The company said in October it would adopt a “wartime work atmosphere” and cut its 248,000 headcount by as much as 100,000 by year-end, more than the entire labour force of the U.S. coal sector. As a state firm, it still has to grapple with its various “social responsibilities”, including the pensions of 180,000 retirees as well as the upkeep of 42 hospitals and 130 schools in the region. With Chinese economic growth dipping to a 25-year-low and government waging a “war on pollution”, the plight of Jixi, near the Russian border in the province of Heilongjiang, is echoed across China’s coal belt. The Luan Group in Shanxi province, another of China’s big state miners, said in October that it had no choice but to cut output and put some workers on extended unpaid leave. The industrial provinces of Liaoning, Shanxi and Heilongjiang were China’s slowest-growing provinces in the first half of the year. “Many laid-off miners went elsewhere,” said Xin. Wang Xianzheng, head of the China National Coal Association, said in July that coal firms throughout the country have been slashing wages by as much as 30 percent. His association surveyed 85 coal firms and found that almost half were struggling to pay staff, and many had failed to keep up with mandatory pension and health insurance contributions.